Do you remember the infamous cartoon based in the town of Bedrock? If that is not ringing a bell, maybe this will. “Wilmaaaaaaaaaaaa!” Remember now? 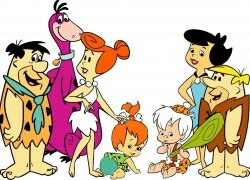 Yes, it’s the Flintstones…the lovable caveman-like family who always seemed to be in a quandary. While the cartoon was great, the bad news is, the vitamin is not. 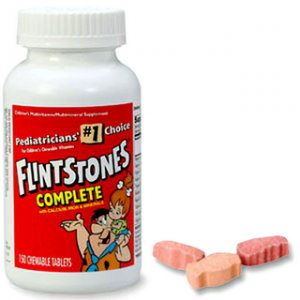 When Flintstones Vitamins came out in 1968, parents rushed out to get these yummy chewable multivitamins that would help keep their kids healthy and strong. Vitamin A, Vitamin C…..Those aren’t so bad, right? Wrong! They are bad, when they are synthetically made. Not all vitamins are made the same. Some are synthetically derived to mirror the real thing but are chemical in nature. Others start as natural, live ingredients and remain that way (for a full explanation of the difference in vitamins, click here). The body responds to a synthetic vitamin as if it is a foreign object—in essence, it does not recognize it as the “real thing” and will reject it. So those Flintstones multi’s that you may think are supplying your kids with their daily essentials are ending up in the “can.” Furthermore, synthetic vitamins may be supplying your kids with more than you paid for. Many cheap vitamin companies use harsh binders and fillers (i.e. tars, plastics, etc.) in the manufacturing of the vitamin to “stick” the ingredients together. A large percentage of many of these synthetic vitamins are not even vitamins, but fillers that will do more harm than good in the long run. How do you think you would do if you ingested small amounts of tar on a daily basis for 10 years or so? The long-term effects would probably not be the most positive. When you look on the back of the Flintstones box to see the list of ingredients, the first thing that jumps out at me is the known carcinogenic (cancer causing) artificial sweetener, Aspartame! The list of ingredients also includes things like Artificial Colors: FD&C Blue #2 Lake, FD&C Red #40 Lake and Calcium Carbonate. In addition, in the list of ingredients, only the name of the vitamin or mineral appears, without its chemical name. No plant sources were given. So what’s the solution, you may be asking? For many, this is all you may have ever known and you may have believed you were doing something great for your kids! Well, you were, in the sense that you really care about their health and made a noble attempt to do something about it. So don’t be discouraged. It is never too late. Begin by getting rid of the synthetic store brands and adding in a whole food supplement that is actually alive. These live nutrients will fill in the gaps where we may not be doing the best in the food category. A kids diet is a tough one for every mom, so supplementing wisely can really give good peace of mind. Just make sure it is whole food. 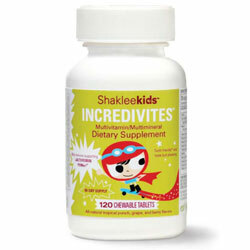 Our family has used these whole food supplements with all of our children, starting when they were babies. To see why they are different, read here. For a full label and ingredient view, click here.